Old Path: Bit of pulk "sledding" with my dog. 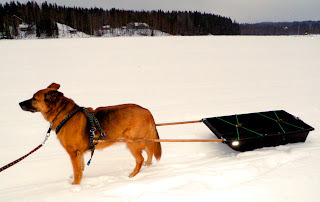 Heres a snapshot i quickly took, while i was at the lake, training my dog, to get him used to pull sled behind him. Its just an ugly, plastic big pulk meant for ice fishers, but as it was dirt cheap, i thought i could convert it to a dogs sled. I own still one wooden, bigger and better pulk "ahkio", but its missing the bottom piece, so instead i had to use this makeshift thingy. All the hardware, is from local tiny hardware store, nothings dedicated dog sled stuff, except for the dogs harness, which is a ManMat product, made especially for pulk pulling. Total price without harness is under 50 euros, including pulk, rods, reflective stickers, nuts and bolts, everything, so it sure isnt a bank breaker. I was glad to see that dog seemed to like pulling it, and did it fast, with 40 kilos of weight, as well, if encouraged. Hopefully my hand, that i injured pretty bad, heals enough in next two weeks, so i could do some more serious hiking, with ski´s and dog pulling the pulk. I sure would like to ski to my kota, through the woods with my dog ad hang out there over the weekend. Funny thing is here in Maine USA we have exactly the same ugly square sleds for ice fishermen as you have there. I think they are made to pull behind a snowmobile. They probably come from the same factory in china. I have read that the key to easy pulling sleds is to keep the area of contact on the ice big and the minimum pressure on that area. So the total weight is distributed over a larger area and is easier to pull. I'd say that it's not bad at all. if it works for both you and the dog, keep it that way. People should let their dogs work more, instead of keeping the animals just sitting and laying there. The dogs like it and they too get their exercise, keeping them healthy and fit. I hope you'll be doing better soon! On the other hand, you might want to challenge yourself a little and see how well you can do, while being limited... Just a tought.